OSSEO LION MEMBERS! 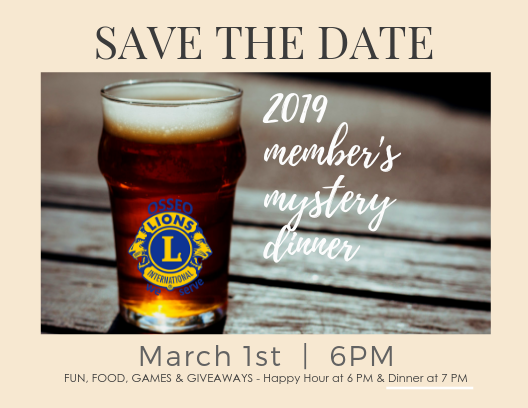 Mark your calendars and plan on joining fellow members and their dates for the night at this year's Member Mystery Dinner Night in Maple Grove! We'll be dropping clues over the next couple of weeks. Put your best guest in the COMMENTS at the bottom of the page. The 2nd & LAST clue will be revealed on February 19th. Location will be Announced Feb 20th. If you can guess correctly before then you'll earn an extra ticket in our drawing the evening of the event! We need members to confirm if they'll be attending and how many will be attending from their party by the 21st of February so we can reserve enough food. The cost per member/guest will be $18 per person and includes dinner, one drink ticket, one entry to a special drawing for the evening, and Lion Bruce's MC expertise! I’m going to register me and Richard so you can see the notification. Cant wait to see what we do! Thanks Lion Tanya, I just registered on line. Thank you for doing a great job with that. We’ll be on the Lookout ot see where it is! Going to Brick and Bourbon? No, Lion Leon. But, that’s a good guess. My venue guess is Omni Brewing Co.
Never been to Omni ! Looking forward to it!